What better way to enjoy cake than eating with your eyes first? Seriously, appearance is a big deal to make the dessert more special for celebrations and more appetizing for everyone. On that note, get ready to go over our interesting list of the best cake decorating tools. 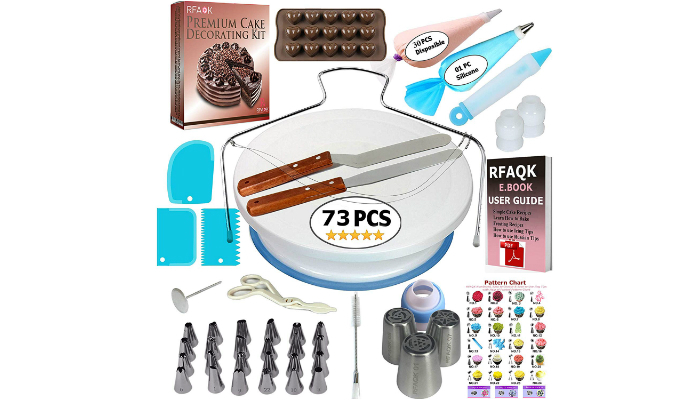 If you’re looking for a really good deal, we highly recommend RFAQK 73 pcs Cake Decorating Kit. It is surprisingly affordable despite the number of items included in the set. It is perfect for budget-conscious bakers who are planning to improve their decorating skills. 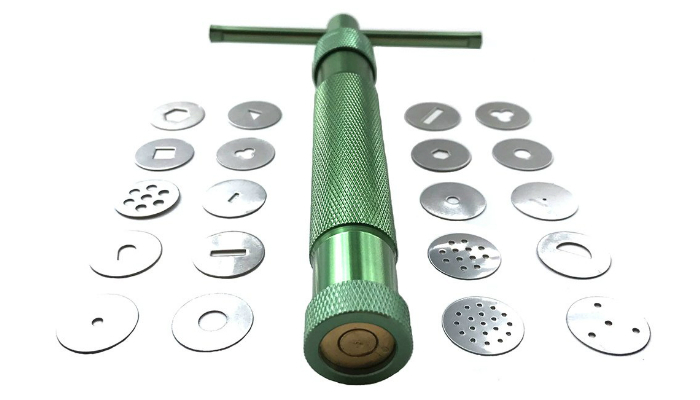 This product includes a cake leveler, heart-shaped chocolate mold, pastry bag, decorating pen, flower nail, flower lifter, and cleaning brush. It also has two couplers, three Russian tips, three cake scrapers, and 30 icing bags you can safely dispose of afterward. Of course, this kit also contains icing tips. Each one of the 24 tips is marked with a number to match the pattern chart. The collection includes two round tips, two petals, two French, two basket weaves, two drop flowers, three leaves, four close stars, and five open stars. Now, let’s focus on the 11-inch turntable for both right- and left-handed users. It is supported by a stand with concealed ball bearings to revolve clockwise and counterclockwise without any hassle. When it comes to cleaning convenience, the non-toxic surface is also nonstick and dishwasher-safe. Next, we have the 11-inch icing spatulas. The straight one is for the sides of round cakes. Meanwhile, the angled design will let you form icing from the top while you rotate the turntable. Decorating cakes isn’t just about icing. With fondant, you can form sugar paste to create miniature objects and intricate details. And, that’s where TEOYALL 25 Pcs Fondant Modeling Set proves its purpose. Since working with fondant requires steady hands, each tool is lightweight for better control. As a plus, most of the items are double-sided to perfectly achieve any shape possible. Despite the amazing purpose of this cake decorating kit, the best thing about it has something to do with versatility. It can also be used for craft projects involving clay, paper flowers, and soft metal. If you want to cover the entire cake with fondant details, HEVERP Stainless Steel Fondant Extruder is what you need. It is a very durable tool that can withstand heavy use. This product comes with 20 tips so you can make various ribbons made of fondant icing. Some tips can even be used to create edible hair for figure toppers. Don’t worry about cleaning this tool. It can be separated into three components so you can wash hard-to-reach sections with soap. 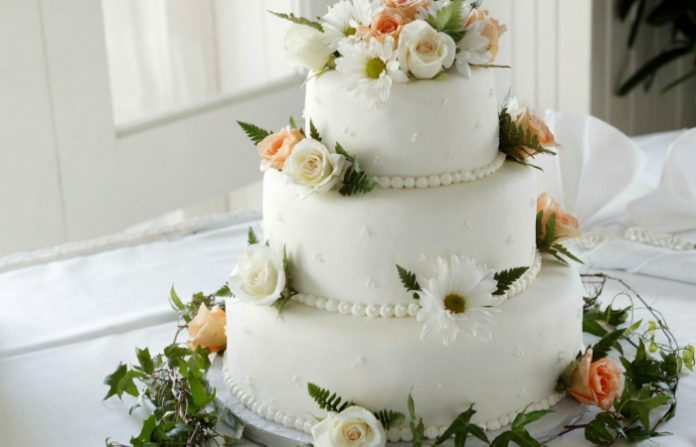 Sometimes, a simple decoration is enough to make a stunning cake. 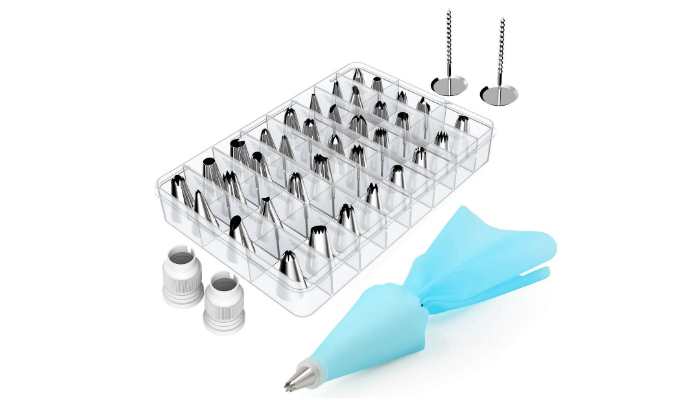 If you just want a cheap yet high-quality set of tips, Kootek 42 Pieces Cake Decorating Kit is an excellent choice. It specifically has 36 stainless steel tips, two pastry bags, two couplers, and two flower nails. More about the pastry bags, they’re reusable so you can save money. There’s no need to worry about tricky cleaning because they’re made of nonstick silicone. And, since the tips are made of premium stainless steel, they won’t corrode or rust. They will never leave a weird taste on the icing. Regarding the patterns, this set includes 11 open stars, seven closed stars, four leaves, three French, three round tips, three rose petals, three special tips, and two plain tips. Each tip has a diameter of 0.7 inches and a height of 1.26 inches. Use the small round tip to write “happy birthday” or any greeting on the cake. One hand should guide the movement while the other is squeezing the pastry bag (a little pressure will do). To make “teardrop” details, make a dot with a small round tip and simply drag the cream a little bit. 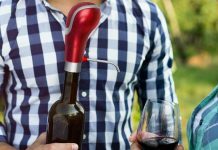 Meanwhile, with an open star tip, lightly press it on the surface and squeeze the bag without additional movement. However, you may twist the tip a little bit if you want. If you want more volume with the open star tip, make thick swirls by putting more pressure on the bag and guiding the tip’s movement. You may also turn the tip clockwise without breaking the line to make beautiful shell-shaped borders. To make ruffles, use a leaf tip. Slowly make a straight line to ensure the frosting stays thick. For a pretty floral icing, just use a petal tip. Feel free to use the flower nail, but you have to dab a bit of frosting first at the center of the head. Icing can serve as a glue for the parchment paper you’ll place on top of the nail. Remove the tip of the pastry bag. Make a huge dot on top of the parchment. Attach the petal tip again. Make half-circles around the base while making sure the tip stays vertical. Slowly remove the flower from the nail by pulling the parchment off the head. Put freshly made flowers in the freezer to set. One of the basic ones is called the ball tool. Smaller balls are for details such as eyes while the bigger ones are perfect for flattening fondant. Meanwhile, modeling tools with pointed tips are for outlines. The point can either be thin or thick, but there’s one definite purpose. This design is best for making smiley faces and animal scales. Choose the attachment or disc you want to use in forming the fondant. Unscrew the bottom part of the extruder. Place the disc and hold it as you’re preparing to reattach the cover. Install the cover again by twisting it into place. Put fondant into the tube. Turn the handle until the fondant comes out of the bottom part. 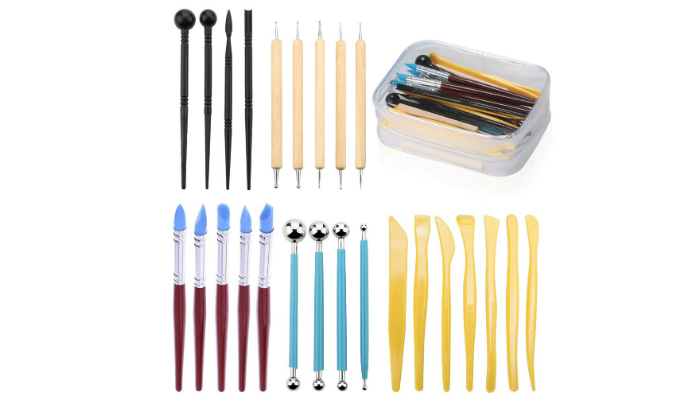 Out of the best cake decorating tools, we selected RFAQK 73 pcs Cake Decorating Kit for the top spot. It has everything you need for a wonderful decoration without forcing you to spend hundreds of dollars on it. For other products you might like, check out the best cake pans and cookie cutters.